David Letterman wants to make sure you don't vote for Republican presidential candidate Mitt Romney, unless he appears on The Late Show before November 6. On Friday night's "Late Show," David Letterman couldn't help but notice that election season is rapidly coming to a close. With only a few weeks left until Americans hit the polls, the host would love to have Mitt Romney come visit the show and balance out the fact that President Obama has already stopped by. The only problem? Romney doesn't seem interested. 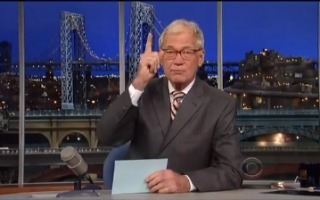 So Letterman devised a plan: he instructed his audience to not vote for the GOP candidate unless he makes an appearance. Is it a joke? Sure. But who knows, it might just entice Mitt to stop by.